The online version of this article ( https://doi.org/10.1186/s40425-019-0570-8) contains supplementary material, which is available to authorized users. The approval of the anti-CTLA-4 antibody ipilimumab (Yervoy®) in 2011 revolutionized the immuno-oncology (IO) field by significantly improving long-term survival in patients with metastatic melanoma. Since then, six additional checkpoint inhibitors targeting programmed cell death protein 1 (PD-1) or programmed death-ligand 1 (PD-L1) have been approved, and a large number of other IO drugs have entered clinical development. In addition to checkpoint inhibitors, these include costimulatory molecules, e.g. OX40, glucocorticoid-induced TNFR-related protein (GITR), 4-1BB, CD27 and CD40 [1, 2, 3]. CTLA-4 is constitutively expressed on T regulatory cells (Tregs) and is upregulated on other T cells upon activation [4, 5]. CTLA-4 is highly upregulated in the tumor microenvironment (TME), particularly on Tregs [6, 7]. Several mechanisms of action of CTLA-4 blocking antibodies have been proposed, including activation of effector T cells by blocking the CTLA-4 pathway and depletion of Tregs via antibody-dependent cellular cytotoxicity (ADCC) or antibody-dependent cellular phagocytosis (ADCP) [6, 8, 9, 10, 11]. The relative clinical importance of these mechanisms is still debated [8, 12, 13]. One approach to improve the response rate and reduce immune-related adverse events of anti-CTLA-4 antibodies is to direct the effect to the tumor using bispecific antibodies (bsAbs) . Therefore, we have developed ATOR-1015, a bispecific CTLA-4 and OX40 targeting antibody. Similar to CTLA-4, OX40 is highly up-regulated on activated T cells, particularly Tregs, in the TME [6, 7, 19]. By targeting two receptors that are overexpressed in the tumor, there is a potential to increase localization to the tumor area compared to monospecific antibodies. This in turn may reduce the risk of systemic T-cell activation and improve the efficacy. Moreover, it has been proposed that combining a checkpoint inhibitor with a T cell costimulatory agonistic antibody may convert a cold tumor into a hot tumor by enhancing T cell expansion and effector functions while controlling the suppressive function of Tregs [20, 21]. Several anti-OX40 mAbs are in clinical development either as monotherapy or in combination with a checkpoint inhibitor [22, 23, 24], but except for ATOR-1015, there are no other bsAbs targeting a checkpoint inhibitor and a T cell costimulatory receptor in clinical development. The ability of ATOR-1015 to induce depletion of Tregs has been demonstrated both in vitro and in vivo. 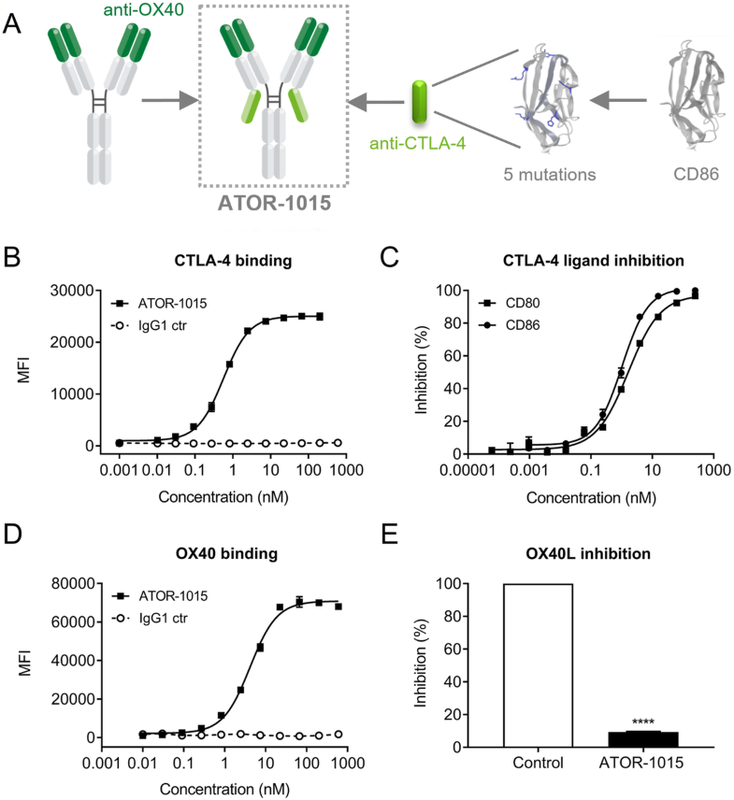 Using an ADCC assay with primary Tregs and NK cells, ATOR-1015 induces target cell lysis to a similar extent as the combination of anti-OX40 and anti-CTLA-4 antibodies. The OX40 expression on the Tregs was very high whereas CTLA-4 was barely detectable, indicating that the responses seen in vitro mainly are mediated by OX40. 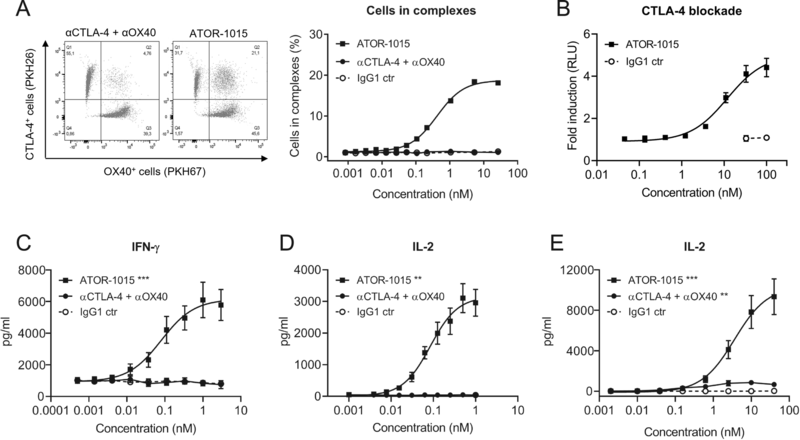 However, in the ADCC reporter assay with Tregs or target-expressing CHO cells, ATOR-1015 is superior to the combination of monotargeting antibodies. The reason for this discrepancy between assays is not known, but it might be that reporter assays that measures FcγRIIIa engagement are more sensitive to avidity effects, whereas the NK cell-mediated lysis of Tregs is more dependent on target receptor density. Intratumoral expression of the NK cell marker CD56 has been shown to correlate with clinical response to ipilimumab in patients with melanoma, suggesting that anti-CTLA-4-induced Treg depletion is mediated at least in part by NK cells . Non-classical monocytes in the TME also express FcγRIIIa, and they have been reported to partake in the Treg depletion in cancer patients treated with ipilimumab . 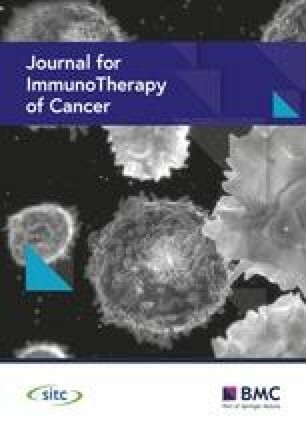 Further, an increase in the CD8+ T cell/Treg ratio in the tumor is demonstrated in mice bearing MC38 or MB49 tumors following ATOR-1015 treatment, whereas the ratio is unchanged in the spleen, indicating that there are no systemic effects. No change in the CD8+ T cell/Treg ratio was seen with the monotargeting anti-CTLA-4 antibody. Several studies have demonstrated that anti-mouse CTLA-4 antibodies induce depletion of intratumoral Tregs [6, 31, 32, 33], but there are also studies where this could not be detected [21, 29, 34]. Increased intratumoral CD8+ T cell/Treg ratio has been associated with therapeutic response both in pre-clinical studies in mice [8, 32, 35], and in cancer patients [36, 37]. In the present study, the observed increased ratio with ATOR-1015 is a result of both Treg depletion and expansion or infiltration of CD8+ effector T cells compared to monospecific anti-CTLA-4 treatment. 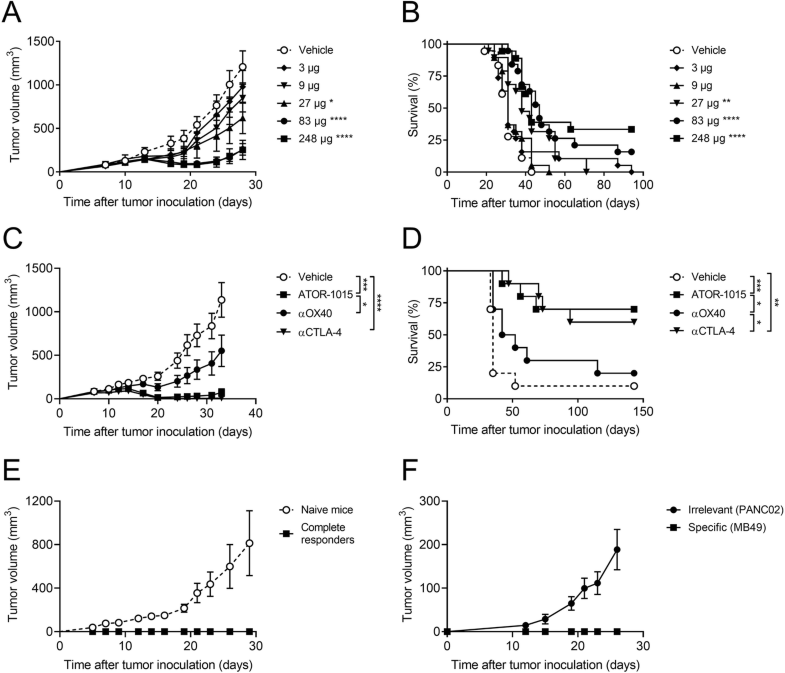 Dual targeting of CTLA-4 and OX40 clearly improves the Treg depletion in these in vivo models. Moreover, targeting of OX40 increase the amount of ATOR-1015 detected in the tumor area. 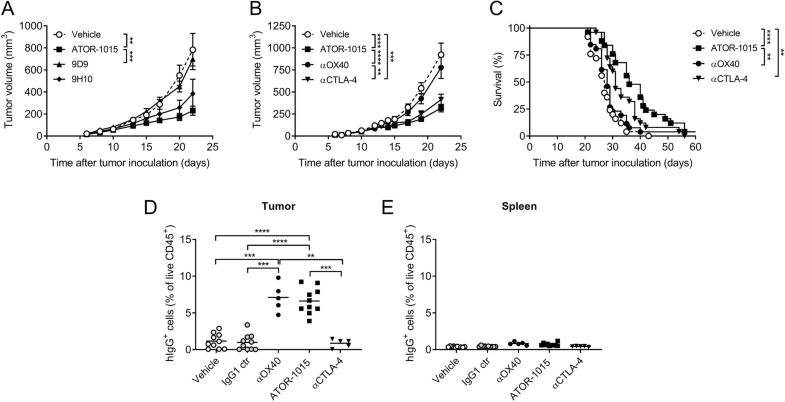 The anti-tumor responses of ATOR-1015 were studied in a novel hOX40tg mouse model, enabling studies of both OX40- and CTLA-4-mediated effects. 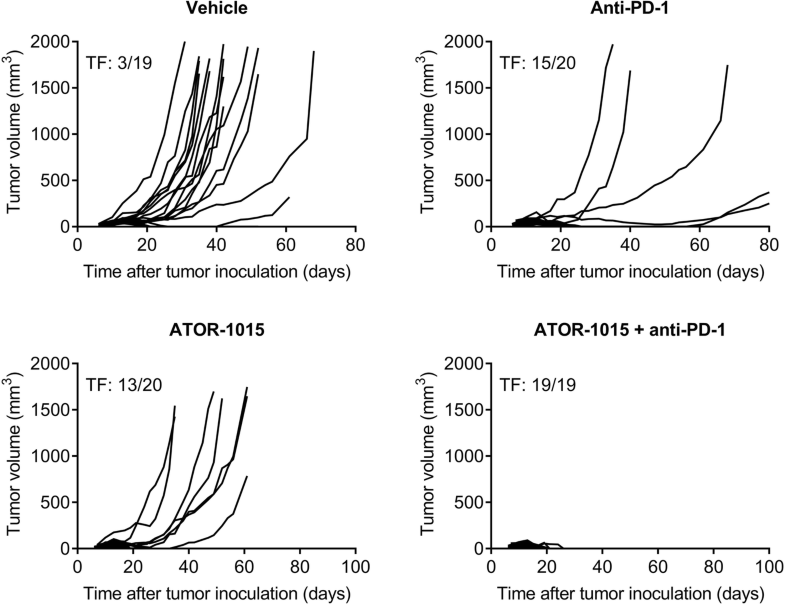 ATOR-1015 shows potent anti-tumor activity and improved survival in MB49 and MC38. Interestingly, the overall anti-tumor effect of ATOR-1015 in MB49 was higher in heterozygous than in homozygous hOX40tg mice, despite lower expression levels of OX40. Heterozygotes were obtained by breeding male homozygotes (C57BL/6) with female BALB/c mice. Thus, the differences in anti-tumor activity are likely explained by the different genetic background and immunological variation between the strains. It is well known that C57BL/6 and BALB/c are different in e.g. Th1/Th2 polarization, MHC haplotype and NK cell phenotype [40, 41]. In addition, anti-tumor effects are demonstrated in CT26 colon carcinoma and PANC02 pancreas cancer models (Additional file 7: Figure S5 and Additional file 8: Figure S6). The resulting immune response is tumor-specific and provides long-term immunological memory. However, no effects on tumor growth or survival were observed in the B16.F10 melanoma or A20 B cell lymphoma models (Additional file 9: Figure S7). The lack of response in B16.F10 probably relates to its invasive and low immunogenic nature. 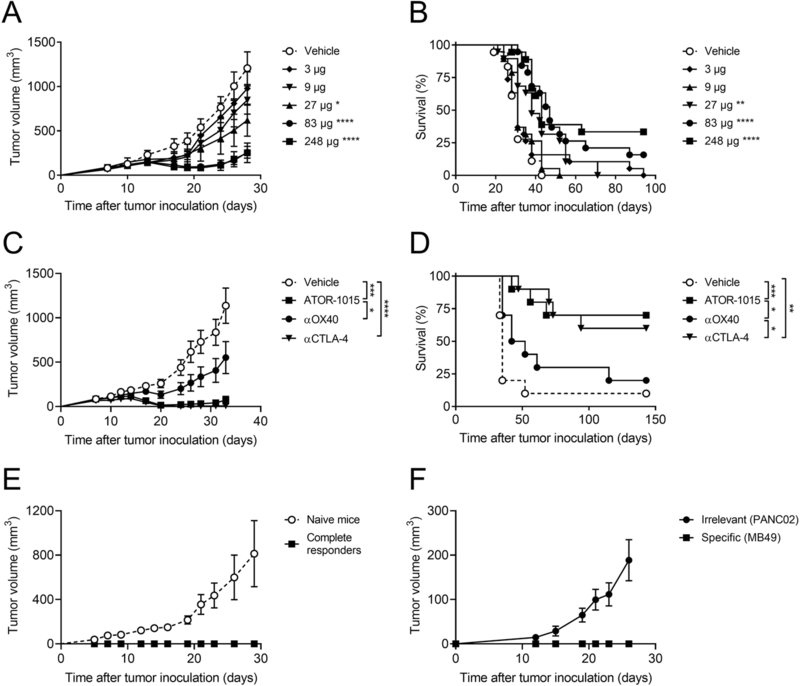 It is well known that IO drugs administered as single agents, including CTLA-4, generally are poor at inducing anti-tumor responses in this model [42, 43, 44]. In A20, analysis of infiltrating lymphocytes revealed very few CD4+, CD8+ and Treg cells compared to what was seen in MB49 and MC38, which may explain the lack of effect. Thus, our data supports clinical testing of ATOR-1015 in cancer patients, particularly in patients with T-cell infiltrated tumors such as melanoma, NSCLC and RCC, based on the clinical data from studies with ipilimumab. Lastly, it is demonstrated that ATOR-1015 enhances the effect of anti-PD-1 treatment in mice with bladder and colon cancer. Combination therapies with antibodies targeting CTLA-4 and the PD-1/PD-L1 axis are approved in several indications, and there are more than 250 ongoing trials . While the combination is very effective in some indications, the rate of adverse events doubles compared to single-agent therapy, with treatment-related adverse events of grade 3–4 in > 50% of the patients [45, 46, 47]. This has limited the number of patients that receive and tolerate the treatment and led to the use of sub-maximally effective doses for combinations with PD-1. CTLA-4 therapies with optimized clinical benefit to adverse event ratio would therefore enable more effective treatment, move combination therapy into frontline, and increase the potential for neoadjuvant combination therapy in more indications.